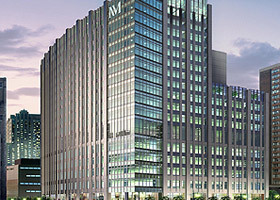 The New Prentice Women’s Hospital is a 17-story project for the highly respected Northwestern Memorial Hospital (NMH) Women’s program. It is the largest center of special care for infants in the country, and is among the top three maternity centers in the country by volume of births, with a capacity for 13,000 deliveries a year. Significant features of this facility include a large neonatal intensive care unit, surgical suites and a medical imaging center. MEP system highlights include a 3,800 ton central chilled water plant, (3) 600 HP high pressure steam boilers, variable primary pumping system, an extensive smoke management system, dedicated critical care space pressure control systems, and a robust emergency power system including (3) 2,000 KW, 4160V generators. E Cube provided LEED fundamental and enhanced commissioning plus commissioning of additional systems including fire alarm, fire protection, emergency power, medical gas, and engineered smoke management.